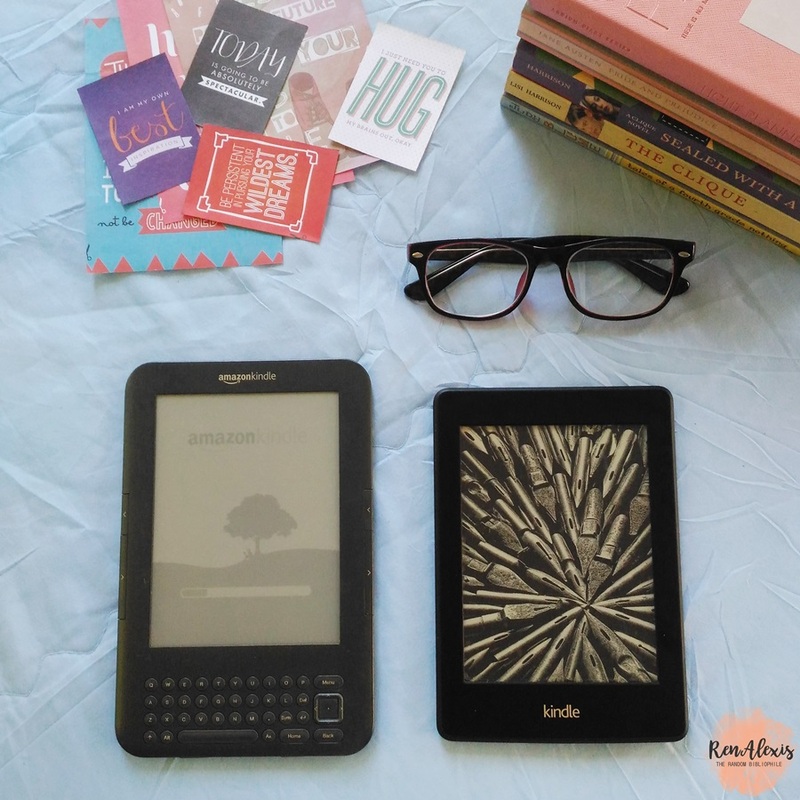 It was four years ago when I was given my first kindle and I fell completely in love with reading for the hundredth time. I was a third-year college student that time, barely living off with my not so huge allowance so I can't really buy new books every time I finish reading something. And then this beauty came and I can finally read endlessly without spending much of my allowance to indulge in reading the books I wanted. Heaven is for Real, On the Island, and The Hunger Games trilogy were among the first books I read on my first kindle. I was instantly hooked to this new technology. Imagine, having hundreds, even thousands, of books stored in this little device that once you finish reading one, you can just go on and pick the next book to read! No more lugging around carrying bulky books to pass your time when you're idle. The kindle is perfect for me because I really like reading everywhere. I read when I'm riding the bus, when I'm stuck in travel, when I'm waiting for someone somewhere, in the kitchen when I'm cooking, and of course, in bed at night, before I go to sleep. Don't get me wrong, I love physical books, I do. I collect them whenever I have some money set aside to spend. But that's the thing, my priority in life wasn't to spend all my allowance and savings in buying the newly released books. My family isn't rich, so I can't really shop for books all the time. I do go to book sales and bargains and lose my head picking at all the titles they have. The kindle allows me to read the books I want, ALL the books I want. I just search for the e-book and then I'm set. I have a collection of e-books that I have yet to read. 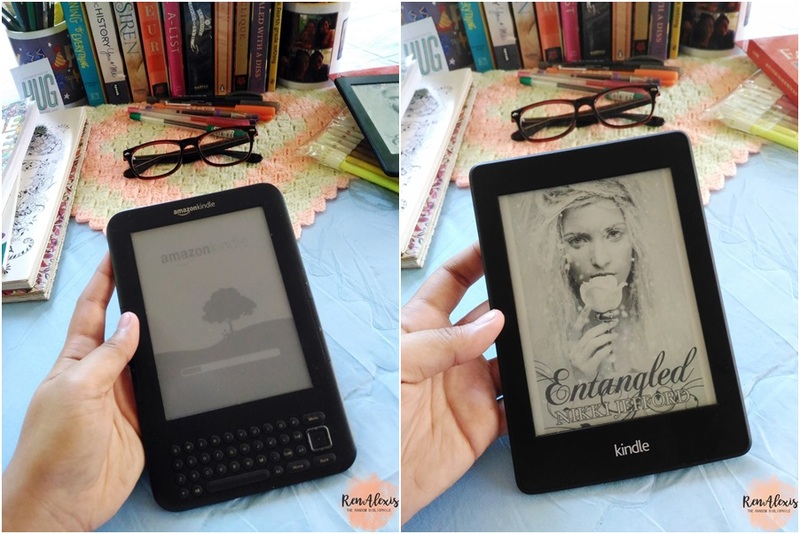 There are people who do not like e-readers and I can't understand where they are coming from. Maybe they think that e-readers negate the essence of books? I don't know. I love e-books, I love physical books. I enjoy the best of both worlds. I've already had two kindles by far. 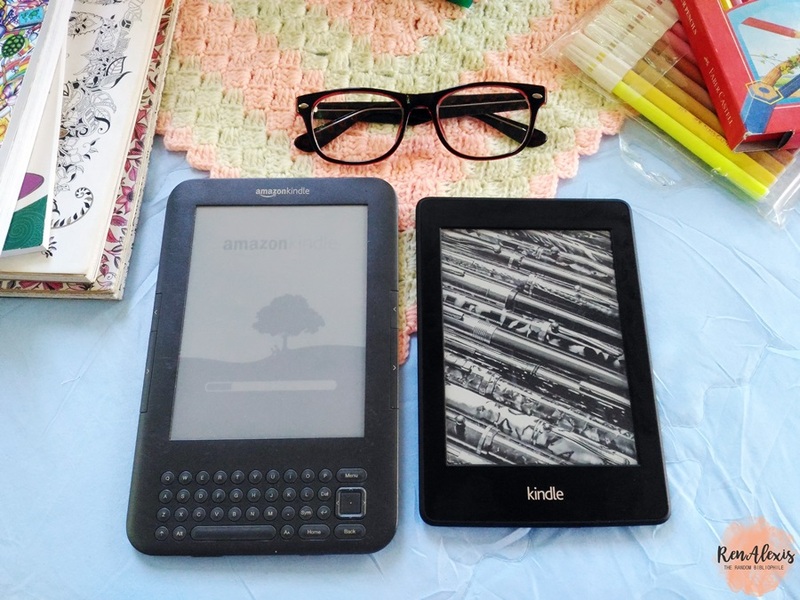 The first one I owned was the kindle keyboard and I really loved it. It broke early last year when I was reading The Death Cure and I wasn't able to restore it. I didn't know what happened, it just suddenly won't turn on again. I was devastated because that kindle was a gift from my godmother. I've read so many books with it and it was the reason why I had written so many book reviews on my tumblr site. It really had a sentimental value to me but I couldn't revive it, I didn't know how to. So I moved on, thinking I would have to read on my phone from that moment on. But thankfully, I am blessed with people who sees how important reading is to me. 1. It is light and handy. I can take it wherever I go. It is very travel-friendly! 2. It stores up to thousands of e-books. Your choices will be endless! 3. Its battery is superb. You only have to charge it once a month. It can even reach until two months if you don't use it that much. 4. It is very user-friendly. It's super easy to transfer e-books to it from your laptop. 5. The screen does not hurt or strain your eyes from reading. 6. 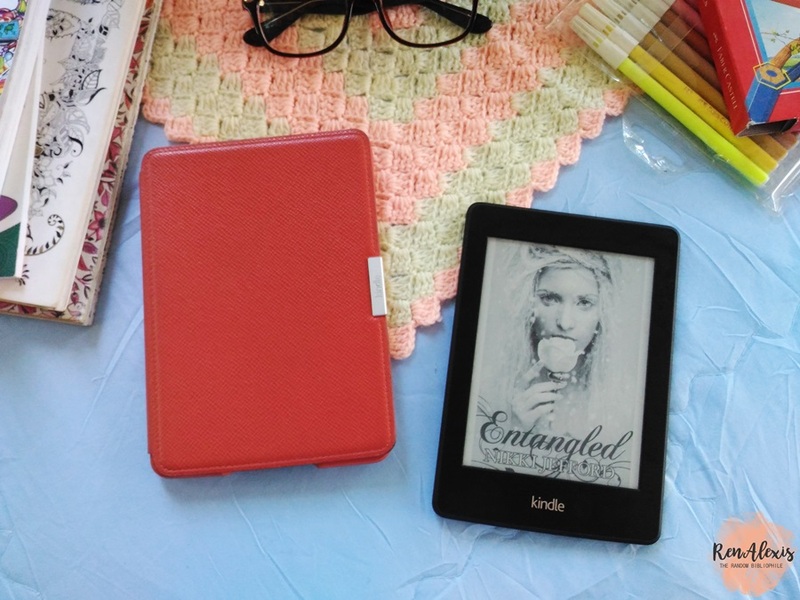 The kindle paperwhite has a built-in light already unlike the kindle keyboard, you can still adjust the level of brightness so you can read even when the lights are out! 7. It does not glare in bright sunlight, unlike tablets, so yes to reading outdoors!!! 8. Three words: built-in dictionary. This is probably my favorite feature of the kindle. Whenever I come across a new or unfamiliar word, I just click it and I can then read what it means. This is my dilemma when reading a physical book, I have to open a dictionary first before I can proceed, but with the kindle, it's super easy to look up the word! 10. You can adjust the text size based on your preference. If you like reading small fonts, adjust it, if you like the bigger ones, be my guest. 11. It has wi-fi so you can buy and download books from the kindle store and store those books in your cloud so you can never lose a book! So convenient. 12. And lastly, it connects to your Goodreads so whenever you start and finish a book, you can update your Goodreads with it. 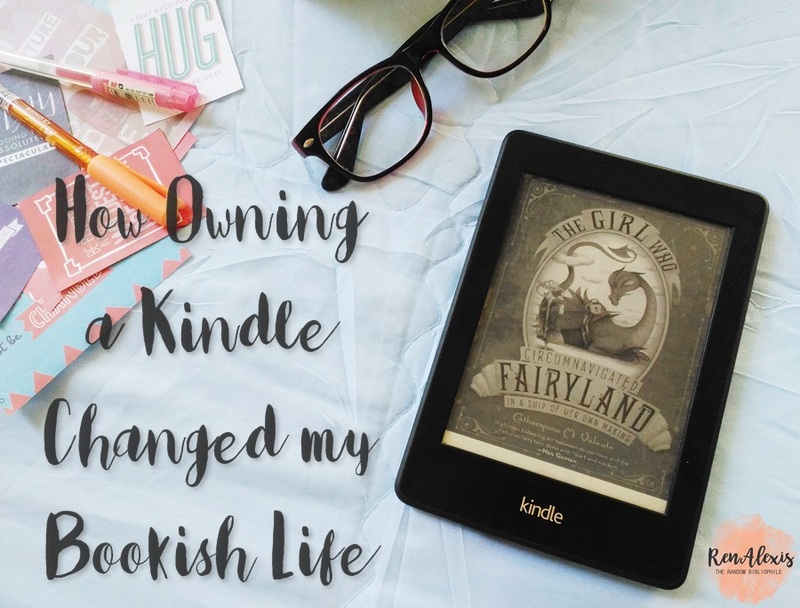 Having a kindle for several years now had definitely changed my bookish life. With it, I can be updated with the new books my favorite authors had published. I can read the books I don't deem worthy to buy at bookstores, and I can read old books I don't see at the stores, too.